Jackpot Capital has just added another slot game to its mobile casino. It's called Henhouse and I know you're going to like it because it's been one of the most popular games in the online casino since it launched last fall! You can try the new specially enhanced version for iPhones, iPads and Android phones and tablets by going to http://m.jackpotcapital.eu in the browser on your mobile device. Until September 24th, you can even cash in on some nice bonuses when you try this game! 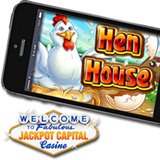 Henhouse mobile players can get deposit bonuses up to $150 plus free spins. There are no wagering requirements on free spin wins! To claim these bonuses just enter coupon code FREERANGE60 as you deposit. Henhouse is a fun game that you can be play for as little as a penny per spin. However, if you're feeling lucky you can place a max bet of $125 per spin. Three scatter symbols start the Henhouse Pick Feature bonus round that takes players to a house full of hens, each hiding either a prize – up to 3X multipliers – or a rotten egg that ends the round and sends players back to the barnyard to spin the reels. There are more bonuses to be won through the $100,000 Back on Track casino bonus giveaway that continues until October 13th.